The latest edition is the resource for any practicing OB/GYN, family physician, midwife, or pharmacist who prescribes medicinal products to or evaluates environmental or occupational exposures in women who are or may become pregnant. Based on the highly successful seven German editions of this reference, the up-to-date drug listings have been revised into a handy pocket guide color tabbed for quick access to important information. Easy to reference each drug is listed discussing the side effects, general impact on organ systems, potential toxicity, and risks before offering dosage recommendations. It is the only book of its kind to provide conclusive information on treatments for diseases during pregnancy and lactation and actions to be taken after (inadvertant) exposure to drugs suspected to be developmentaly toxic. 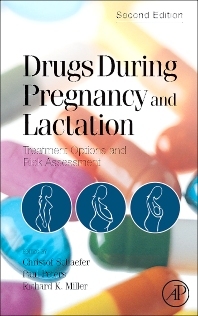 Unlike other dosage guides, this edition is an affordable, compact compendium of knowledge on the very latest drugs and their effects on pregnant/lactating women.